American Idol got nearly twice as many viewers as the televised Grammys ceremony when they clashed on US TV, audience figures have shown. Talent show Idol, the most watched US TV programme, was seen by 28m viewers when it went head to head with the annual awards event. The Grammys got only 15m, according to the Nielsen ratings system. 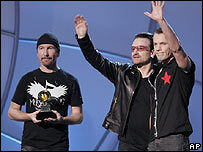 Madonna, Coldplay and U2 all performed live at the awards, with the Irish rockers collecting five prizes. Idol was on the Fox network at the same time throughout the first hour of the Grammys coverage on CBS. After Idol finished, the three-and-a-half hour Grammys show audience rose to an average of 17m, two million less than last year and its lowest rating for at least 11 years. Only two years ago the Grammys was watched by 26.3m. Singer Kelly Clarkson, who won the first Idol series, won two Grammys this year but did not mention the show which launched her career. Mariah Carey, rap star West and R&B newcomer John Legend topped the nominations with eight each - and picked up three awards apiece. Alison Krauss and Union Station also took three awards, including for best country album, US rockers Green Day won the prestigious record of the year trophy, and rock band The White Stripes won best alternative album. The ceremony even featured a rare public appearance by reclusive funk pioneer Sly Stone, who had not performed live for almost 20 years. Castaway drama Lost was the second most popular show in the ratings, with 18.8m viewers.